In the picture above, top right is north and the image covers 27.8 x 34.8 degrees. Image centre is located at 16:40:20.0, -25:25:30 (H:M:S, D:M:S, J2000) Astrometric data from Astrometry.net. Scorpius is one of the few constellations whose star pattern resembles its name. The curved stinging tail is marked by the star Shahula, probably from from the Arabic 'Al Shaulah' meaning 'raised tail', as seen in a scorpion. In the body of the scorpion lies Antares, meaning 'rival of Mars' for its reddish colour. The head of the scorpion is echoed in the star name Dschubba, meaning 'forehead'. However, the scorpion shape looks trucated in our photograph and it is. In ancient times it extended into what is now Libra, where the brightest stars (not seen here) still carry the resonant names Zeubenelgenubi (α1,2 Lib, the southern claw) and Zeubeneschamali (β Lib, the northern claw). This celestial scorpion was sent by a jealous Artemis to kill Orion, who sitll fees the venomous insect:as Scorpius rises Orion sets, and vice-versa. However, he could not be saved even by Asclepius, the god of healing, who was later sent into the heavens as Ophiuchus, the serpent wrestler, a symbol still used by the medical profession. 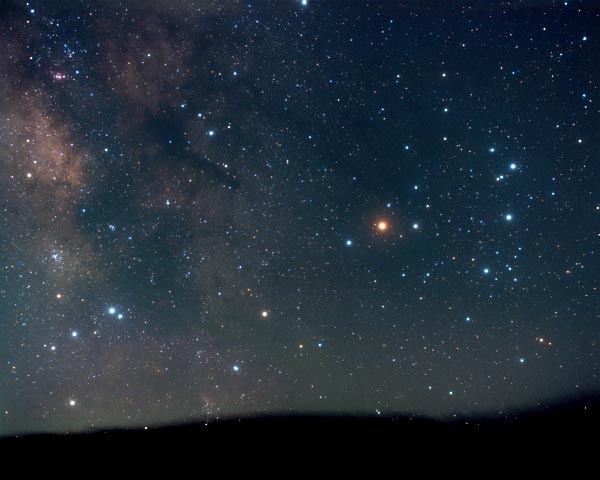 The constellation bestrides one of the richest parts of the southern Milky Way and is adorned by many beautiful stars. It is rich in young stars clusters and the nebulae from which they spring. Some examples are listed below. This images was made with Scorpius close to the horizon and with an exposure made to emphasise the bright stars. Another view shows more of the Milky Way in a longer exposure. Acrab (β1,2 Sco), Alniyat (σ Sco), Alniyat (τ Sco), Antares (α Sco), Dschubba (δ Sco), Jabbah (ν Sco), Girtab (Sargas, θ Sco), Graffias (β1 Sco), Lesath (υ Sco), Shaula (λ Sco).